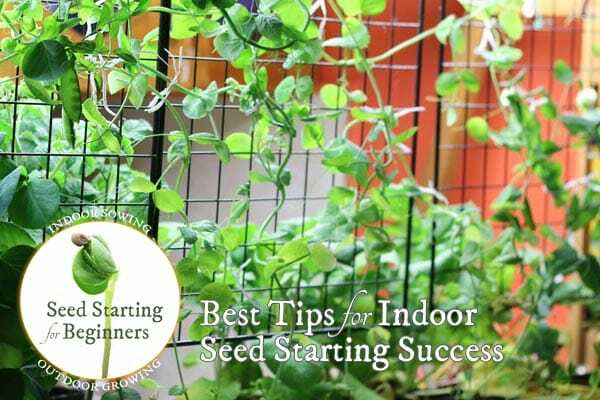 If you want to be sure your seeds germinate successfully indoors, this checklist will help. These are all the little things that can help or hurt your seed sowing. It also provides a good overview of the steps, so you know what to expect as your seeds grow. Before we jump into the actual seed sowing instructions, have a look at these tips so you can avoid some rookie mistakes. 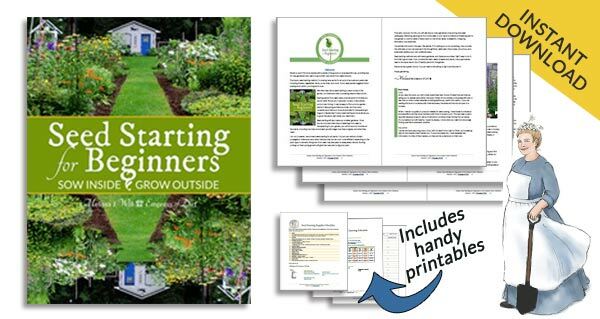 With the right seeds, methods, and precautions, there’s no reason you can’t have dozens of beautiful, healthy starter plants ready for planting by late spring. It starts with the best quality, most appropriate seeds, of course. Locally-grown seeds means you know they can succeed in your growing zone. If you can’t find what you want locally, then make sure the seeds are suitable for your hardiness zone, climate, and growing conditions. Organically-grown means they survive without extraneous riff-raff. Always a good choice! Non-invasive plants only! Or trouble will be your friend. Fresh seeds that have been properly stored ensure maximum germination rates. Before you sow, double-check the seed packet for any special growing instructions. Some seeds need a chilling period (in the fridge) first for a few weeks. Others require pre-soaking in water, or their coats scratched to enable sprouting. Many are simply ready to sow. Check the expected germination rate and sow extra seeds to accommodate it. 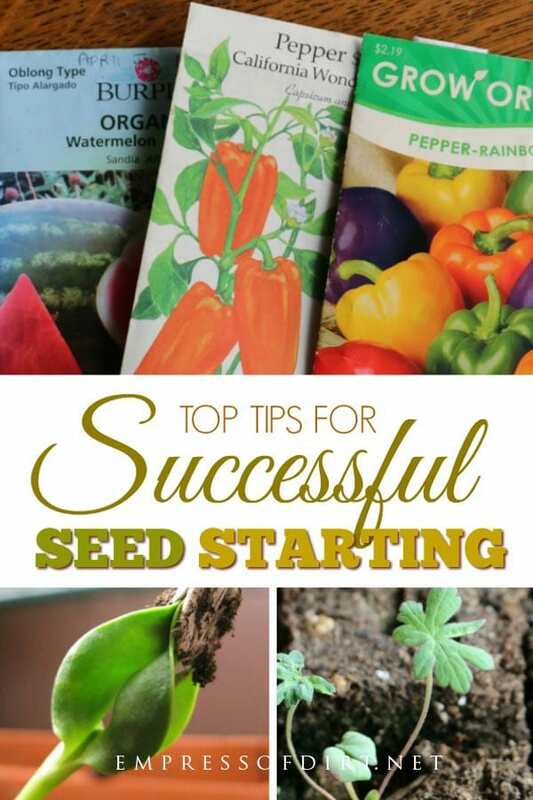 For example, if your flower seed packet says the average germination rate (fresh, healthy seeds) is 80%, this means you can expect approximately 8 out of every 10 seeds sown to sprout. If you want at least 10 plants, I’d sow 14 just to be sure (an heir and some spares). Also, some seeds have low germination rates, so read your seed packet to avoid surprises. A good growing environment for indoor seed starting is free of pathogens. To ensure this, use proper seed starting mix (or make your own using the homemade soil mix here), and, wash and bleach any containers, trays, and tags before use. The recommended solution is 1-part bleach | 9 parts water. This, along with the use of an electric fan to circulate air can help prevent unwanted gnats, mold, algae, and soil-borne fungi from forming. I’ve never had it happen yet, so knock wood to that. Provide consistent warmth and moisture. Seeds are comprised of a protective coat with embryonic tissue and food stores inside, providing all the energy needed for the initial growth stages. We store them in cool, dry environments to keep them dormant. To awaken a seed and trigger germination, conditions must change. We do this by exposing the seed to moisture and warmth, using water and growing medium (seed starting mix). The wrong growing medium (too heavy, not sanitized) and/or moisture and temperature extremes (too damp, cold, or warm) can stall growth or kill the seedling. Watch your sowing depth. Check your seed packet for instructions. Most seeds are sown at a depth twice their width. Really tiny seeds like poppies are placed on the surface because they need light to germinate. Better to plant a seed a bit too shallow than deep, otherwise the seed will use up too much energy getting to the surface. Mind the crowd. My preferred method is sow seeds one at a time, spaced out, so they never require thinning. Others like to sow many seeds and thin them out later. Either way, by the time true leaves are formed, be sure your seedlings have enough root room to grow. Pay attention to temperature. Each type of plant has preferred germination temperatures. 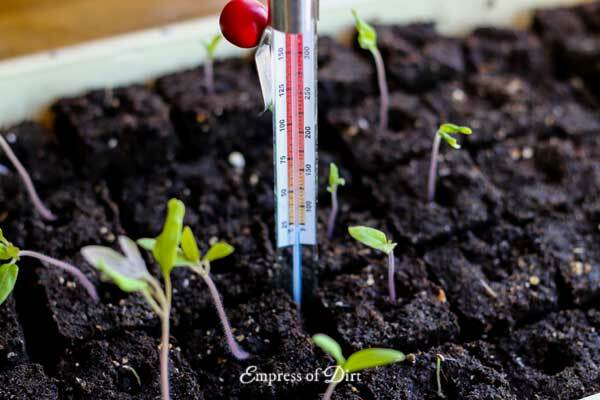 This lists the best temperatures for germinating various vegetables seeds. Peppers are a warm crop and their best germination temperature is 85F. 10 pepper seeds started at 60F, may yield one or two plants, and take weeks to sprout. The same number of seeds started at 85F may sprout within days and yield 8-10 happy plants. To keep it simple, I grow all my seeds in one space and keep the room temperature and growing mix around 69 F | 20C, adequately accommodating the warm and cool seed groups. Any water used is warmer than this. You can check soil temperature with a household meat thermometer. 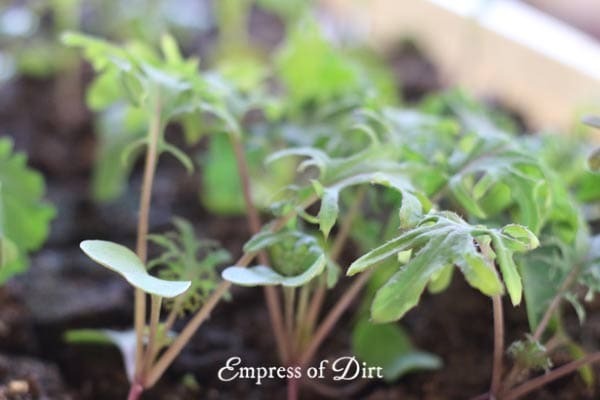 I also have this list of tips for ways to warm up your seed starting area to improve germination. Most seeds germinate in darkness and then grow with light. It is recommended you keep your grow lights on approximately 12 hours each night (or 14 to 16 hours during the day) and place them 2-3 inches maximum above the tops of the seedlings. If the light is not directly above the seedlings, they will stretch and become weak and leggy. Also, rotate your growing containers every few days to avoid leaning. Germination times vary greatly with each seed type. Check your seed packet to know when you should expect each seed to sprout. Some are very quick (within a day or two). Others can take weeks or months. Be sure to tag everything so you know what’s what and when to expect action. Once sprouted, you also need to know the time it takes for the plant to mature. This is also listed on most seed packets. Even within the same species, times can vary greatly. 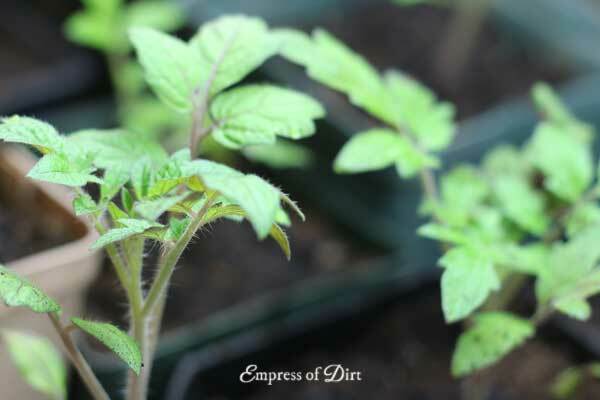 Tiny Tim tomatoes can be ready to eat in just 45 days. Marvel Stripe tomatoes may take as long as 110 days. An organic, liquid fertilizer (at half strength or less) can be used once the seedlings are at least two-inches tall to ensure adequate nutrition. By this point the plant has been moved from its seed starter mix and into proper organic potting soil. Place 10 seeds on a damp paper towel. Providing a gentle transition to life outdoors. This is called ‘hardening off’ and it is explained fully here. Make sure you have the right outdoor growing conditions available in your garden including required light (sun, part-shade, shade), soil type (sand, loam, clay), water (dry soil or well-draining), and so on. 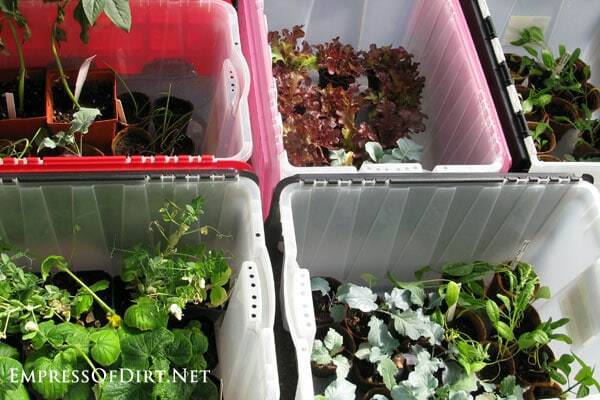 If you don’t have the right space available, container growing may be the answer. I do this for annuals (flowers and veggies) all the time. That’s a good list! If you can do much of what I’ve suggested here, you are on the path to seed sowing success. Everything you need to know to start your own garden plants from seeds indoors.